I know of some regular supermarkets that sell a small selection of necessary ingredients - hoisin sauce, rice vinegar, shiitake mushrooms,... I wanted to broaden my horizons and see what other delights the Asian stores may have. Asian food stores are few and far between here in the South of this island in Tenerife, but I have always loved the experience of putting it as a priority on my day to push the boundaries, almost crippling myself trying to discover where I can find somewhere with an exact ingredient rather than lazily rely on an alternative. And of course, at the end of the day seeing the results on a plate with minimum fuss, maximum pleasure. Thankfully I did find what I was looking for. Asian cooks' paradise is the best way I can describe it. Flowering chives, katsuo bushi, bean curd, pak choi,... poetic names almost. Oh, and the noodles - wheaty ones, rice ones, bucking ones. wrapping ones,... to name but a few. It gave me some inspiration in trying my hand at homemade noodles at a later date. Ok, the ones I had seen here are in the dried noodle format but I have to start Asian style cooking somewhere, right? Noodling is fun on your own but I always prefer to share the experience. When cooking noodles for others I generally like to be neat and tidy for the sake of presentation. Eating alone or in more intimate company, I find that it is more fun not to be so tidy; it´s always nice to slurp now and then. 3. Place oil in a small to medium size frying pan (the smaller the pan, the less oil you will have to use). Heat oil over medium-high heat for a minimum of 1 minute. 4. Heat 1 tablespoon oil in a hot wok or heavy based frying pan and stir fry the shallots for 1 minute. 5. Add the garlic, chilli flakes and pork and continue to stir fry for a further 2 minutes or until the pork is almost cooked. 6. Add the prawns, beansprouts, sugar, fish sauce and mirin and continue stir frying for a further 2-3 minutes. 7. Add the cooked prawns and the coriander and toss so the prawns get some heat. 8. 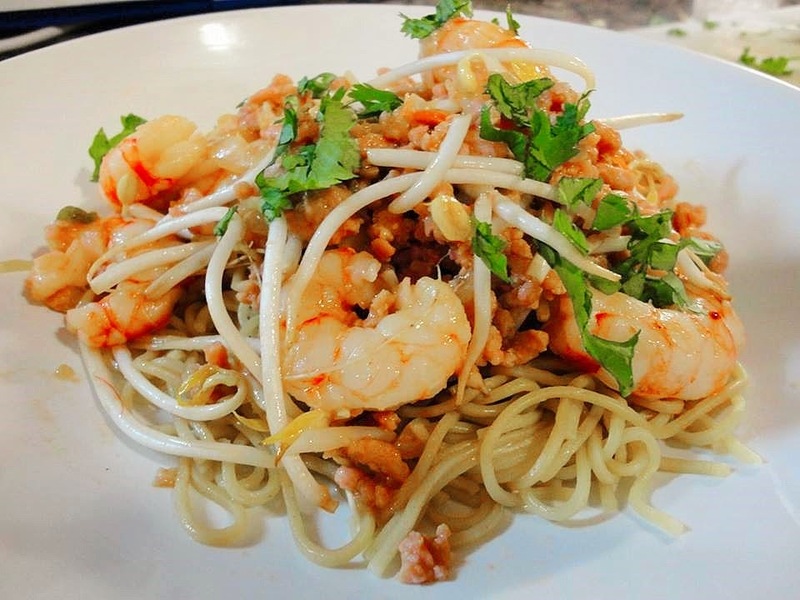 Serve the pork and prawn mixture on top of the rice noodles with the lime juice squeezed over the top.